the government plans to enact a law that gives it the right to look at all your electronic ‘metadata’, so it can see who you’ve called, your web searches, etc. “If you have nothing to hide them you’ve nothing to fear”: Orwell’s ubiquitous ‘telescreen’ operated by the omniscient Big Brother. the government bombs countries that even its own parliament has denied it the power to, thereby abandoning the rule of law. the government promotes its wars on terror and war on drugs. It aids this by telling us daily, via its press releases and briefings, who we have to hate: currently this is ‘immigrants flooding into the country unchecked, because of the EU’. 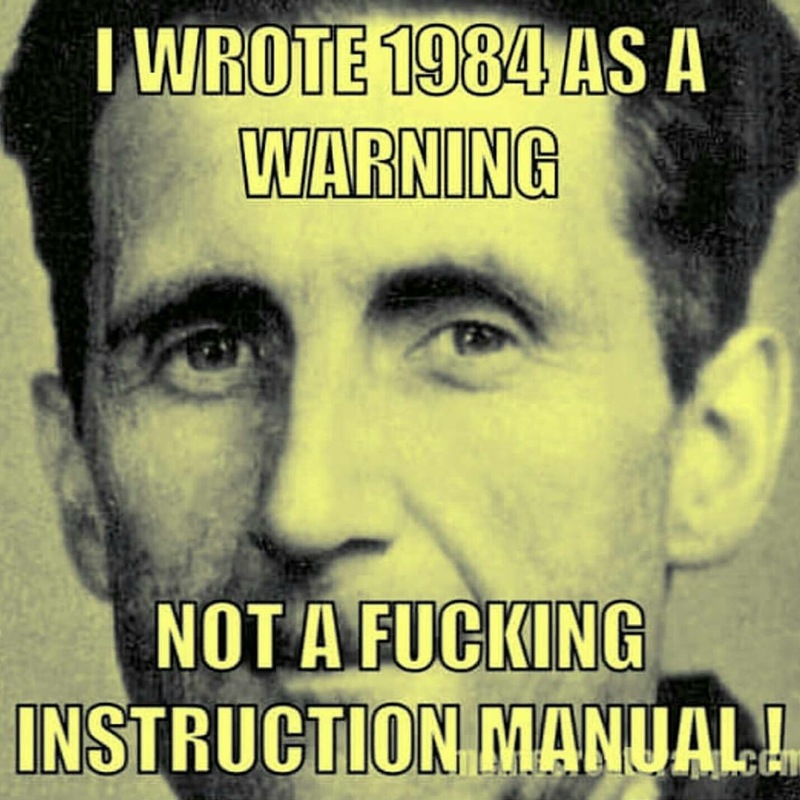 Orwell predicted perpetual war and the daily two minute hate. the language we use is being controlled, words we use are being banned, even thoughts are being outlawed. If we offend someone with our words on a subscription service we can be reported to the police and prosecuted. Orwell predicted the idea of ‘thoughtcrime’; this is now a fact: people are in prison for writing words on a forum where readers have to actively choose to read them. the government tells us that debt is too high whilst simultaneously increasing debt, that it is fighting for our freedom in the ‘war on terror’ whilst simultaneously reducing our freedom, that we need to save money by reducing wage rises whilst giving itself inflation-busting pay rises. Orwell predicted ‘doublespeak’, where the state can convince the gullible populace of two contradictory views simultaneously. the government uses your worst fears to promote its agenda. You’re not able to afford healthcare or support yourself in your old age? The state can help you there. Afraid of terrorists? The state can help you there. Worried your children will be uneducated? The state can help you there? Unable to choose which vendor is honest? The state can help you there. Whatever your worst fear, the state has its solution. Orwell predicted that the state would use your worst fears against you to promote your compliance. This is your personal Room 101. 2 + 2 = 5 Comrade.